Two pianists from the local scene, James Barkovic and Terry Halco, crossed their collective fingers to the delight of a summery Sunday afternoon flock. Their coursing jaunt in the Harvard Epworth Concert Series mingled Mozart, Gershwin, Fauré, Moszkowski, Dvořák and Oldham. Sitting at a single Steinway the two took up favorites of that duo genre. Up first was Mozart’s Sonata in C major, K. 521 described as “rather difficult” by the composer. Despite a smaller Steinway with a bit rumbly bass, the Barkovic-Halco duo beckoned pleasant personalities. The tender turning courtly F major theme of the slow middle movement was heard over again in friendly fashion. For the un-easygoing contrasting material in relative minor key, the duo drew closer to desired tension the further into that section they played. For the Rondo they once again keyed in on straightforwardness. Both Halco and Barkovic are well-known to many choral audiences around Boston serving chiefly as accompanists and organists. After many concerts over a good number of years, Sunday was my very first time to hear either one at the piano in concert. Trading primo and secondo roles, Halco explained, also meant moving piano benches. “James sits relatively low and I sit relatively high.” With two of Anton Dvořák’s Legends Op. 59 these two pianists showed openhanded mien. Throughout No. 3 in G minor and No. 8 in F Major a big synchronized Steinway sound filled the sanctuary. There were more carryings-on from Halco-Barkovic with Spanish Dance in A Major, Op. 12 No. 3. The dancing drone rounded into lively choreography reflecting German- Polish-Jewish composer Moritz Moszkowski’s thematic foray in Spain. Kansas City-born Kevin Oldham left the hospital to premiere his Piano Concerto. Six weeks later he died of AIDS at age 32. For Halco-Barkovic, Oldham’s Andante Tranquillo reckoned sweetly, sometimes with bittersweet high spirits of times past. Its conservative expression under their four hands was at times touching as were its subtly “wayward” moves wake-up calls. This movement from the concerto requires extreme vigilance in unveiling connectivity. The “six minutes of pure feeling captured in a work of art,” a quote in the score as read by Halco, did not fully materialize. 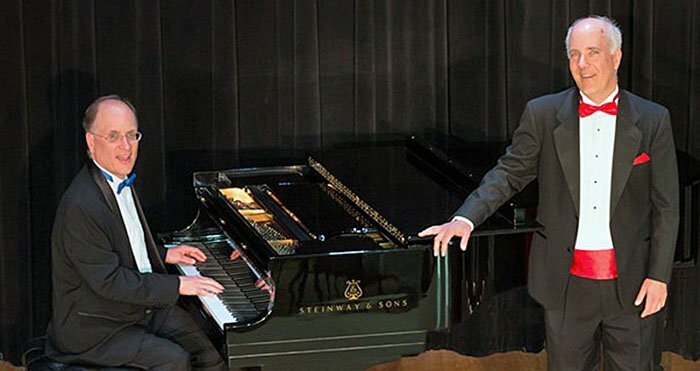 The achievement of the afternoon had to be the Boston duo’s iteration of one of the “most well-known and loved works for four-handed piano,” that being Dolly Suite of Gabriel Fauré. On primo, Barkovic considered a lovely mellifluous way in Berceuse while Halco on secondo lured a music box kind of rhythm to the lullaby. Miaou saw the two long-time friends on the same page conjuring the illusion of but one pianist. Le jardin de Dolly was one of the best I’ve ever heard, there was garden-freshness á la française. With another winner, Ketty-Valse, they wrapped their collective 20 fingers gorgeously around the peerless harmonies of Fauré. Their Tendresse was too determined sounding. The duo attained Spanish flair and French effervescence in Le pas espagnol. The 18-year old George Gershwin’s Rialto Ripples, more a piano novelty than a rag, unleashed a dynamic duo looking for still more “fun.” Swing it they did, oompah had oomph and so did the ragging, that is ribbing and leg-pulling. Afterwards, one of the concert-goers whistled the repetitive riff several times as if it were stuck in his head. To the Barkovic-Halco duo, please come back, give us more. I wish I could have attended. Off-topic, with apologies: Does anyone know if the local Paratore brothers are still performing? although have not appeared onstage for a while, it seems, and when you search http://www.calartists.com there is nothing. The Paratore brothers played at a private concert in Boston in 2013, sometimes reaching their historic standards. It’s impossible to have a phone call with just one of them.